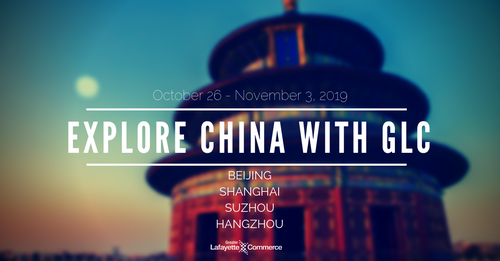 Have you heard that we are organizing a trip to China on October 26 - November 3, 2019? In order to ensure you have the best travel experience, Andrew Antonio, our VP of Chamber & Quality of Life, traveled to China recently for a site visit. He's back and excited to share some stories and experiences with you. Join us for the next informational session on Wednesday, April 24 to learn more about this trip and to hear Andrew's firsthand experiences. If you are unable to attend the informational session, click HERE to be added to the China Trip Communications List.